Discover a collaborative, real-time way to manage calendars and timelines. Whether you need to see a whole year at a glance or plan your week in detail, simply choose one of the free Excel calendar templates below and get started. 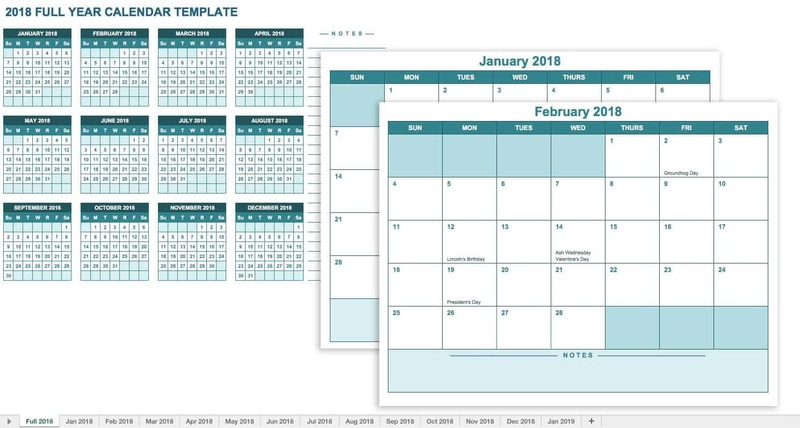 We’ve included yearly, monthly and weekly calendar templates, some specifically for 2018/2019 and others for any year. All of the calendar templates are for Microsoft Excel and are free to download. These templates are compatible with various versions of Excel, including Excel 2003, 2007 and 2010. 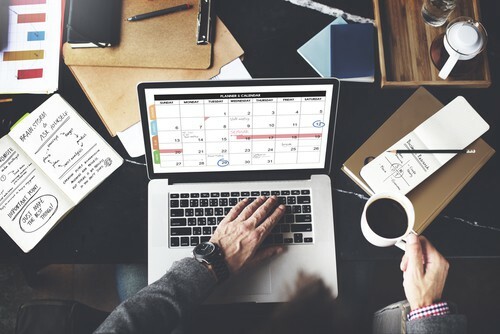 One of the benefits of using a calendar created in Excel is that it offers flexibility with formatting, making it easy to adjust a template to meet your needs. We’ve chosen a variety of calendar styles that are well suited for business, school or personal planning. Some are blank while others include holidays. Excel calendar templates are also printable, and you can choose one with portrait or landscape orientation. 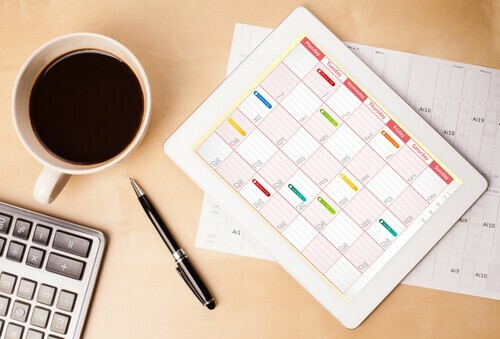 A variety of calendar styles that are well suited for business, school or personal planning. 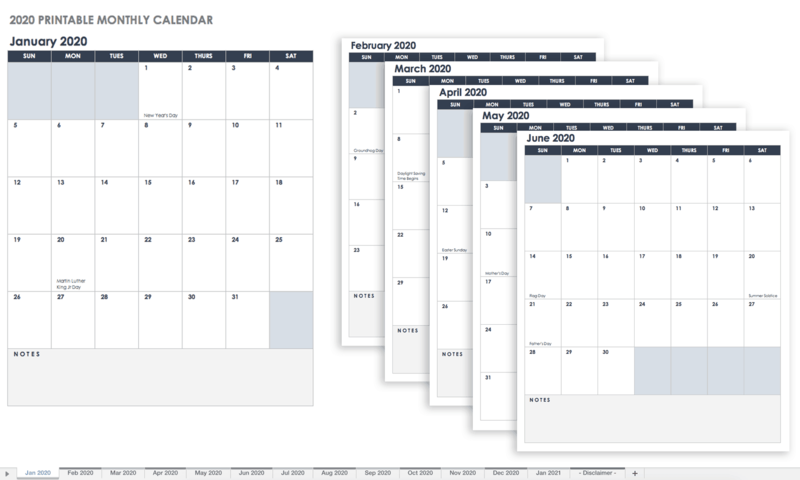 All of the calendar templates are for Microsoft Excel and are free to download. These templates are compatible with various versions of Excel, including Excel 2003, 2007 and 2010. Some are blank while others include holidays. Excel calendar templates are also printable, and you can choose one with portrait or landscape orientation. This daily appointment calendar allows you to select your starting time for the day as well as time intervals throughout the day. Keep track of appointments, projects, meetings, family events and more. Never miss a deadline or forget a meeting again with this bi-weekly work calendar template. It provides a Sunday through Saturday view for any two consecutive weeks. Its straightforward design also breaks each day into morning, afternoon, and evening blocks where you can note to-dos and reminders. Simply enter the “week beginning” date for the first week, and the second week’s dates will auto-populate. This Excel spreadsheet comes with three pages, so you can enter information for up to six weeks at a time.-populates when the start date is entered. Need even more space? The row size can also be adjusted. Monthly Calendar Template (landscape): This blank calendar template shows a monthly view with plenty of space for notes under each date. It also provides a glimpse of the previous and following months to make planning easier. This is a classic calendar style in a landscape format. Blank Monthly Calendar Template (portrait): If you need a monthly calendar with portrait orientation, this free template is simple to use and print. The calendar is blank with a small space at the bottom for notes. Choose a year and a weekday to start your calendar, and the template will adjust the dates accordingly. 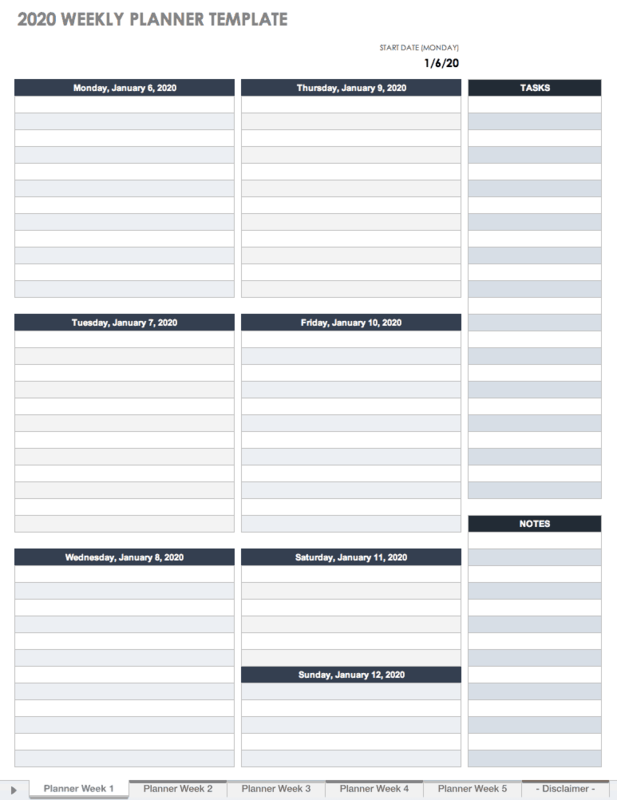 This is a full year calendar, so you get 12 months in one free template. 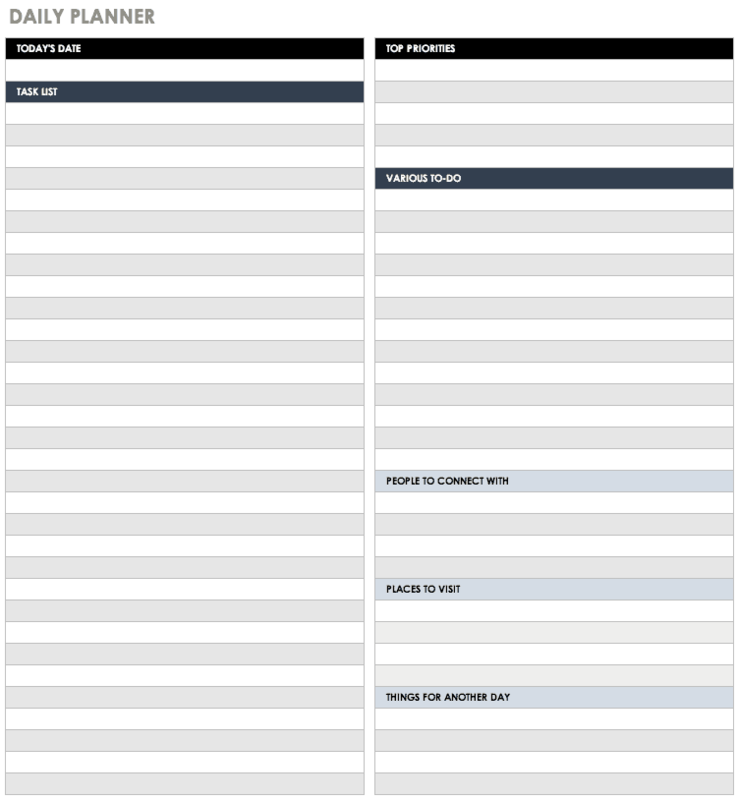 This free template includes 12 months in separate worksheets, so you have access to a full calendar year with plenty of space for each month. The first worksheet in the template shows all of 2018 for quick viewing, along with a separate column for notes. The simple formatting of this weekly calendar template makes it easy to view each week of the year. Keep it compact or create more space for daily notes by increasing the row size. This calendar shows a full week, Sunday through Saturday, and major U.S. holidays are included. 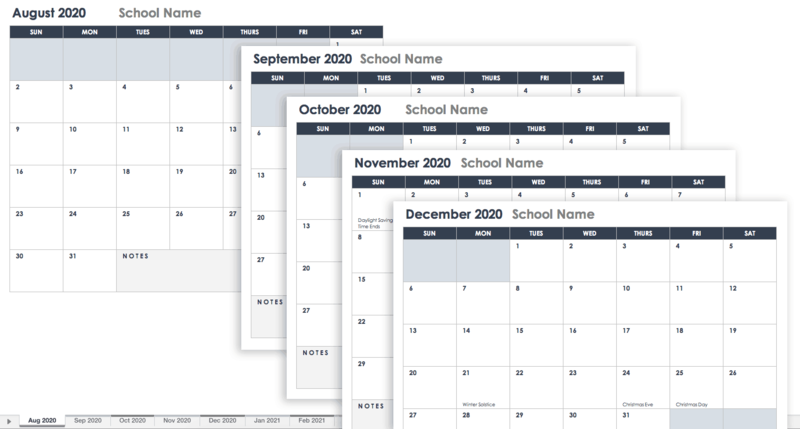 An academic calendar template can be useful for students, teachers or parents. Plan homework assignments, class schedules, conferences and other events. The calendar starts with Monday and goes through Sunday, showing a full week. This free template is for any year that you choose. 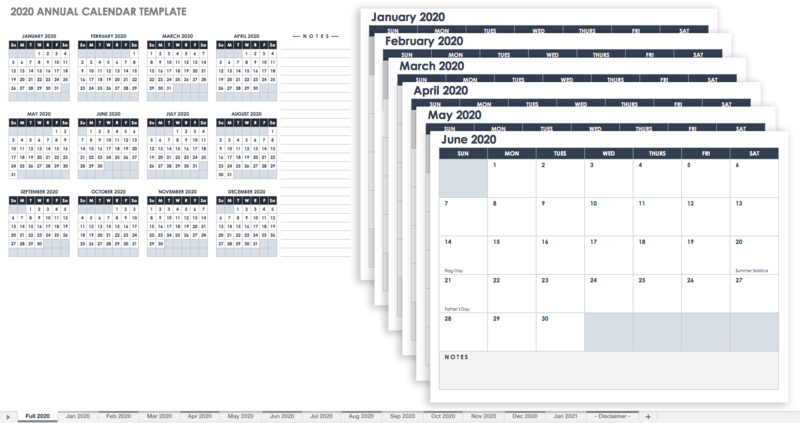 This 2019 and 2020 quarterly calendar template shows three months in one view. The format shows each month side by side, with dates in rows. This makes planning easy, which is perfect for quarterly projects and business needs. The template includes a separate worksheet for each quarter. 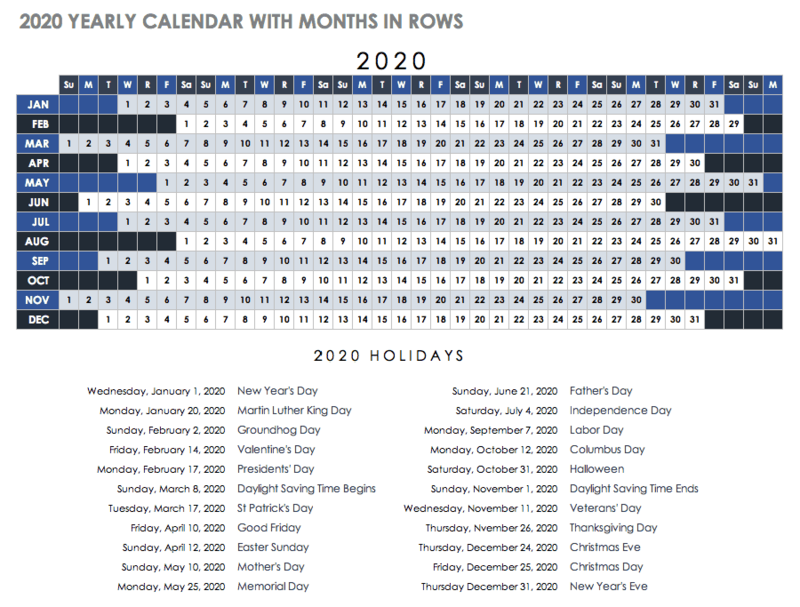 With each month shown in a single row, this calendar template provides a compact view of 2019 and 2020. Holidays are included, and weekend days are distinguished from weekdays with shading. 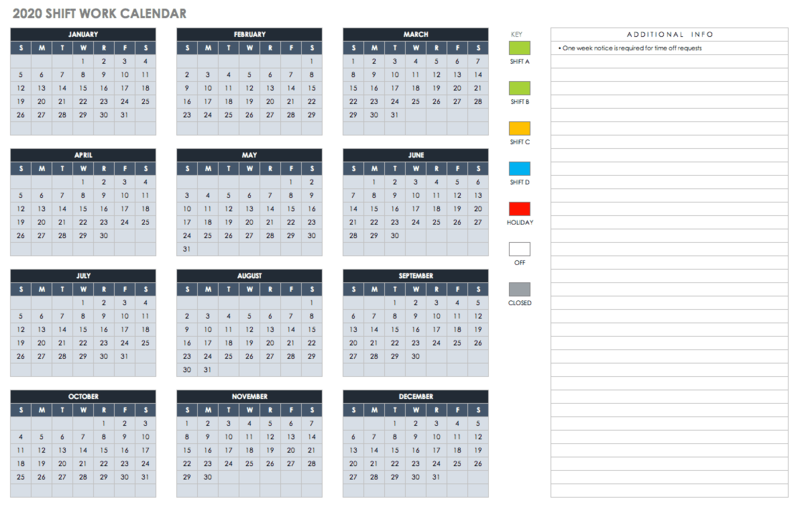 This free Excel calendar template shows a full year view with a lengthy column included for notes. 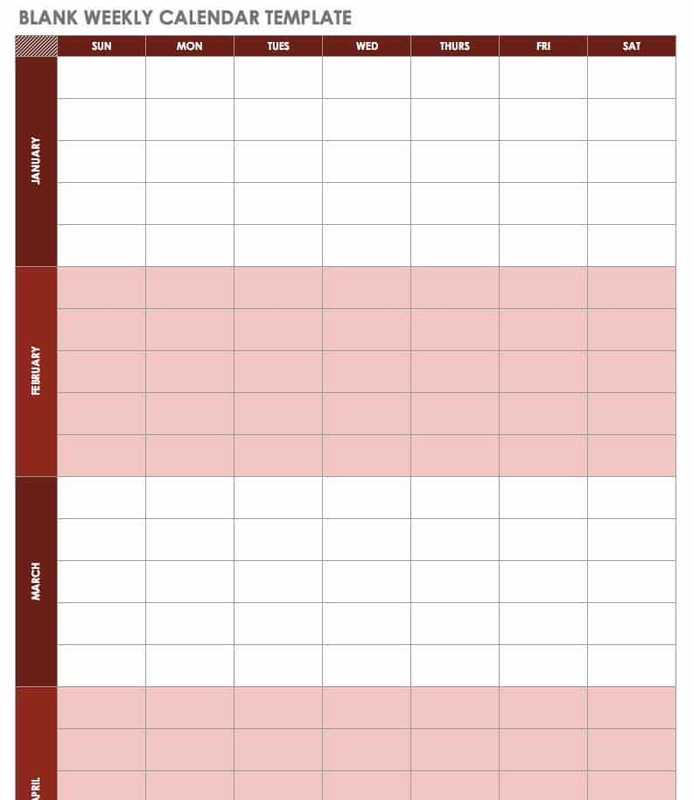 Use this template for planning long-term projects or anytime you need an annual calendar that is easy to edit and print. This versatile weekly calendar template for Excel allows you to record important notes and events for any day, week, or year. Adjust row size to jot down additional details for busy days. And, since all 12 months are displayed on a single sheet, you can easily view your entire week, month, or year at a glance with this clean, basic calendar format. When you need to schedule your time in greater detail, use this weekly planner template for Excel. It offers five sheets with a detailed Monday through Sunday view where you can plan important events, schedule appointments, and organize each day. There are also side panels where you can record additional tasks and make reminder notes for the week. The date for each day of the week auto-populates when the start date is entered. Need even more space? The row size can also be adjusted. Keep track of all your employees’ schedules in one place with this comprehensive Excel calendar template. Use the second two sheets to record the start and end times and total hours of each shift, along with a breakdown of employee names, ID numbers, and pay rates. On the first sheet, record the shifts worked by each employee, and the template will automatically calculate their total hours and weekly pay. It also determines the aggregate payroll cost for the week. Use this calendar template to manage shift-work schedules for each month of the year. Input shift data, holidays, closure dates, and month and year information on the second sheet. Then enter the rotation pattern on the first sheet, and the calendar will auto-populate shift-work schedules for each day, week, and month. This high-level calendar allows you to easily visualize all your work shifts for the entire year at a glance. 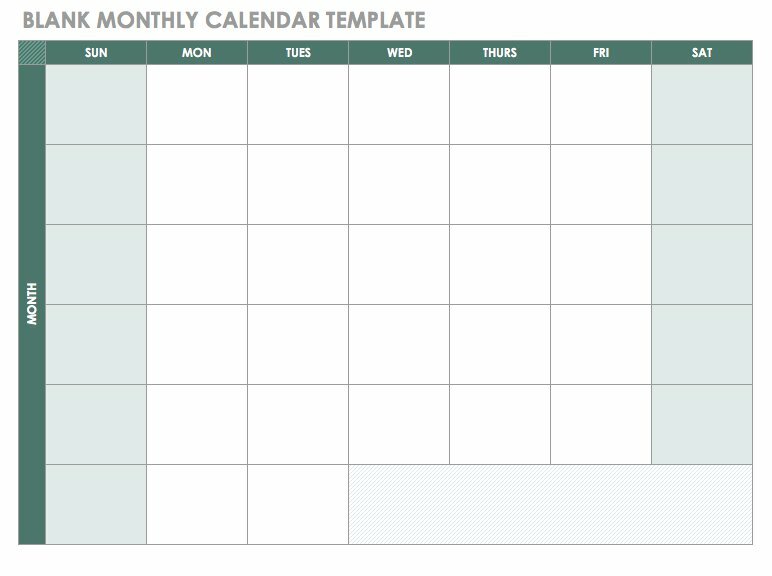 Keep your schedule simple using this blank monthly calendar template for Excel. The weeks are organized in a Sunday through Saturday view that can be used for any month of any year. 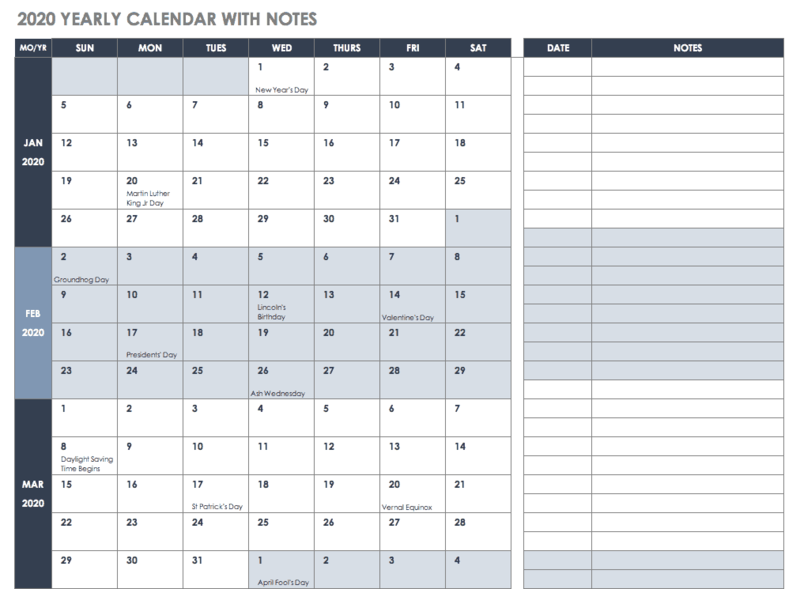 Its straightforward formatting gives you a quick, clear snapshot of your entire month. You can also adjust the row and column size, so you can record as many events, reminders, and notes as you need. 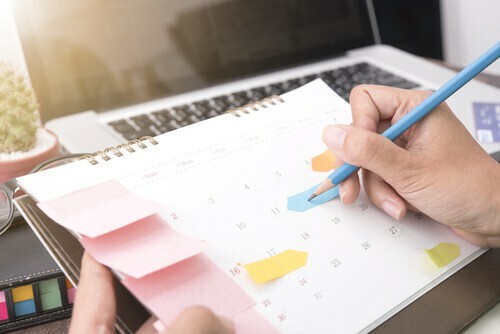 Tracking key tasks, documenting deadlines, and staying up-to-date on daily, weekly, and monthly schedules is important to making sure your day-to-day operations run smoothly. Having the right tool to keep everyone in sync ensures that all projects and processes stay on track and all critical deadlines are met. One such tool is Smartsheet, an enterprise work execution platform that is fundamentally changing the way businesses and teams work. Over 74,000 brands and millions of information workers trust Smartsheet as the best way to plan, track, automate, and manage schedules and timelines. The familiar Smartsheet interface that is designed for how people actually work leads to rapid and broad adoption across your organization. With flexible views, including grid, Gantt, calendar, and card, you can manage your work how you want to. Use self-service reports and dashboards in Smartsheet to provide real-time visibility into resources, status, and performance, so you can rapidly align operations with strategy. Try Smartsheet to discover how you can increase visibility and maximize your planning efforts, today. Discover how you can create a calendar in Excel to track projects, deadlines, and meetings. Save time and get organized with customizable calendar templates for Google Docs and Google Sheets. 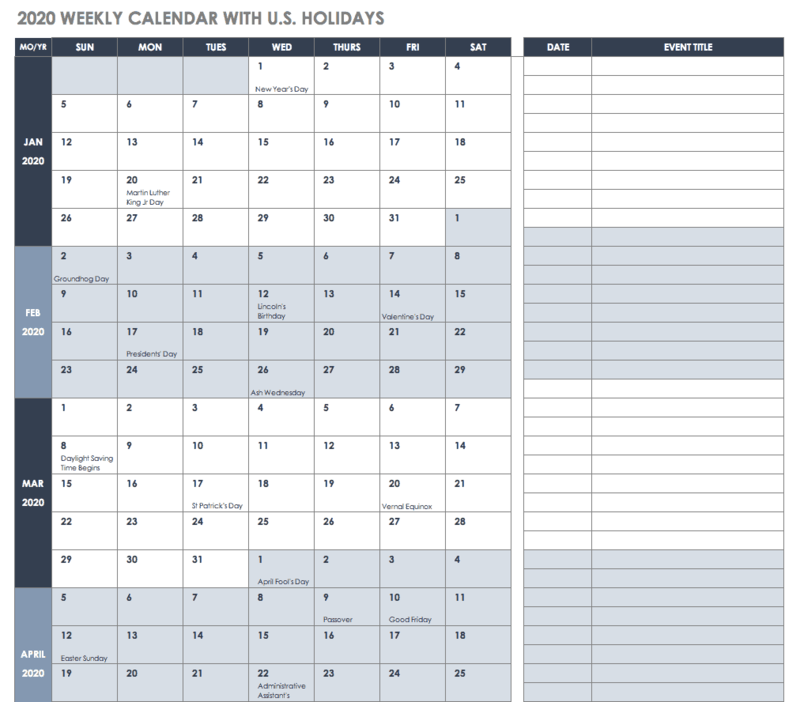 Make school, work and personal planning easy with 20 free calendar templates.